Great battery at the best price. This is a difficult sized battery to find and I wanted 4. 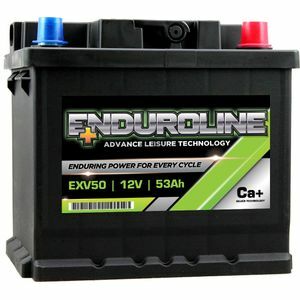 The few suppliers I did find only offered basic flooded batteries at a relatively high price and a 1 year warranty. Tayna not only offered the best spec (sealed ca technology) and warranty (4 years) but also the best price by some margin. The service was efficient and the delivery was very fast. Overall I was very pleased and would definitely come here first for any future battery requirements. 5 stars in my book. Battery is fine-fits the battery box on our boat.Delivery was quick and the packing had been done very professionally and safely. First time ever buying online. I purchased two, the packaging was tremendous, best I have ever seen for damage protection and batteries also sealed in polythene. Arrived in less than 48 hours- and we live at the top of mainland Scotland. Batteries superb! I will order again when the car gives up- soon I think! brilliant service, tried various outlets without success to locate this size of leisure battery, tanya's website found one straight away, ordered and got it next day. excellent!